A new race of beings that emerged from the curse of Cypher. 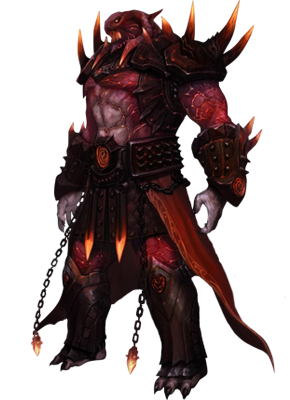 Karus is a nation built by these beings - known as Orcs - located in the glacier area North of Iskanz. They are known as a descendants of Pathos. They left El Morad to escape persecution, and built their own nation with Luferson Castle as its hub. El Morad is the empire of King Manes. El Morad was just a small empire located on the west coast of Adonis Continent. The empire entered a halcyon period when it combined with the 5 empires which fell in the wake of the battle between Pathos and Cypher. Now the peace of El Morad is threatened by Karus. This group of warriors assisted in the defeat of Cypher. As the symbol of strength for Karus, they lead the war with immense health and power. The hero and spiritual leader of Tuarek, Xigenon, thinks highly of their braveness. Formerly known as the Claro mercenaries of the Piana Knights, they changed their names to Arc Tuarek and now fight for the victory of Karus. - Berserker : Always on the front line, and is second to none in strength when compared to El Morad's Barbarian. Has the skill to protect fellow countrymen. - Berserker Hero : Uses rage to unleash the power of a demon. The superior Warrior of Karus, surpassing the Berserker. When Xigenon was born in the year 412, he was born to a Rogue house of Ardream which had resentment toward El Morad for generations. Xigenon educated Tuareks in methods of fighting and means of survival in the wilderness. 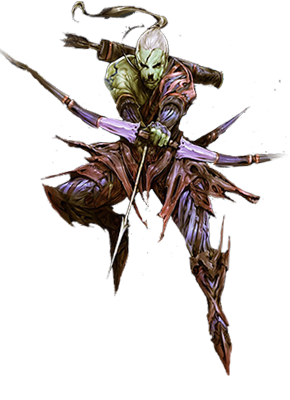 The Rogues of Tuarek possess the true spirit of Xigenon, having great physical and mental balance. These skills allow them to use a dagger and bow masterfully. - Hunter : A Rogue applies hunting techniques to their combat methods. The Ranger will chase an enemy like an animal or hide themselves, approach their target and strike when least expected. - Shadow Bane : The enemy will feel the cold blade of a knight before they notice the presence of a Shadow Bane. Swift and unrelenting attacks bring the enemy into submission. 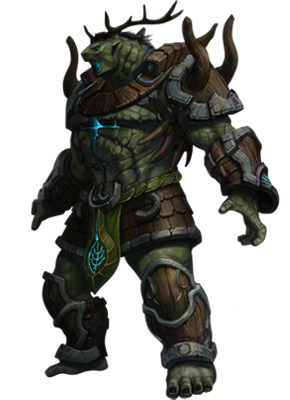 The Wrinkle Tuarek had developed a master plan to build the strength of the Karus nation. They enlisted the versatility of the Puri Tuarek to increase the power of the mage class. These Orcs may have small bodies and weak strength, but this only increases their intelligence and evil spite making their magic power something to be feared. - Sorcerer : The Sorcerer uses destructive magical powers rooted in the elements of nature. Fire has the most destructive power, Ice slows the enemy's movement, and Lightning causes them to faint momentarily. - Elemental Lord : An Elemental Lord rules forces of nature like Fire, Ice, and Lightning. These powers are used as part of their arsenal to attack surrounding enemies with the strength of the elements. The Priest 'Smite' had mastered the power of healing, magic and spell casting with purely sanctified mental energy. This practice was his contribution to the Shaman discipline until his disappearance in the year 360. The skills continued to be studied even after the division of El Morad and Karus. Both nations continue to improve and develop the skill and these practitioners, now known as Priests, carry fearsome powers. - Shaman : The Shaman believes in travelling and communication with the spiritual world. With this kind of power, they are outstanding in mental attacks and curing. 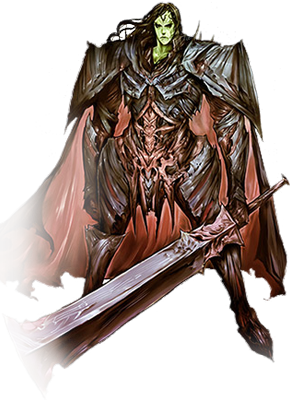 - Shadow Knight : The Shadow Knight has an advantage over the Warrior and Mage with its mental powers. The knight is a great supporter in combat that can heal and attack at the same time. After getting expelled from their original hometown due to their mutation, Kurians created their own colonies and tightly united among themselves and progressed on their own. When Kurians were mutated, they realized that they were never able to go back to the human appearance which they once had before. Since then, they started to absorb spirits to become stronger to distinguish themselves and become the real fighting race. Later on, these once Barbarian warriors who absorbed Fire spirits, conflicted with warriors who absorbed other type of spirits (tree). They did not get along just like Fire and Water. They took a vow that they'll never go back to their original hometown where they were expelled. However, due to the conflict among their own races they are back to participate in Karus and El Morad's prolonged War. - Daphne : Protects allies in battle with their brute strength. The Kurian can usually be found on the front line. - Daphne Hero : Rage mode unleashes the Kurian's true powers. After Xigenon led the Tuareks from El Morad in 448, the absence of the Claro Mercenaries great affected the empire. The men and women of El Morad were determined to retain the warrior spirit by studying the discipline of swordsmanship. Their strength in this field grew immensely and with the help of Barbarians, the warrior now takes a greater role as Tanker in El Morad these days. - Blade Master : A master of Blade skills with the special ability to decrease or cancel an opponent's attack. To be of the Rogue class in El Morad requires specialized, rigorous training. They are taught to strike fast on weaker enemies such as Priests and Mages of Karus. 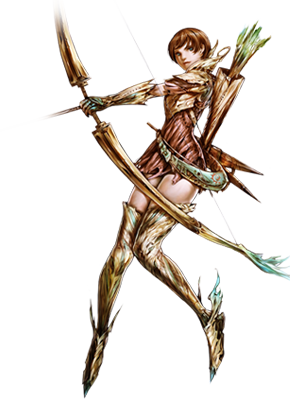 Their stealth skills help them avoid any enemy detection and are deadly up close and at range with a dagger or bow. - Ranger : A Rogue applies hunting techniques to their combat methods. The Ranger will chase an enemy like an animal or hide themselves, approach their target and strike when least expected. - Kasar Hood : Kasar Hood has the most speed and has never been captured due to their agility and quick reflexes. 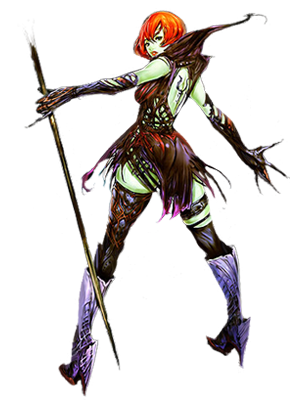 Kasar Hood uses an unrelenting attack to aggravate the enemy and expose their weakness. The El Morad Mages are trained similarly to those in Karus. Since both nations' magic practices predate their separation, they do not yield when faced against the opposition. In 448, El Morad experienced a shortage of mages when the Orcs left. After that, El Morad invested in the training and education of Mages making them indispensable to the empire. - Mage : The Mage uses destructive magical powers rooted in the elements of nature. Fire has the most destructive power, Ice slows the enemy's movement, and Lightning causes them to faint momentarily. - Arc Mage : An Arc Mage inflicts damage using the power of the elements: Fire, Ice, and Lightning. This power is not only cast on the enemy, but also in the surrounding area. The Priest utilizes its great power to heal illness in the world. The power has increased since the defeat of Cypher and the emergence of the Orc race. 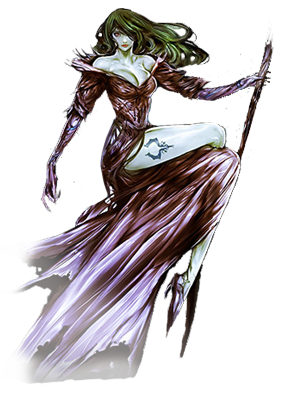 The powers of curse are used to neutralize enemies while magic can improve an allies ability. If there are more than 2 Priests on opposing sides, it may be best to fight with caution. - Cleric : A Cleric is a specialist in healing the injured. 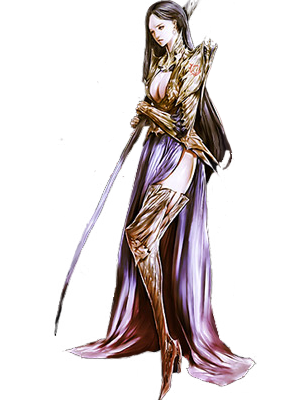 A Cleric can also increase the abilities of allies, as well as place curses on the enemy. 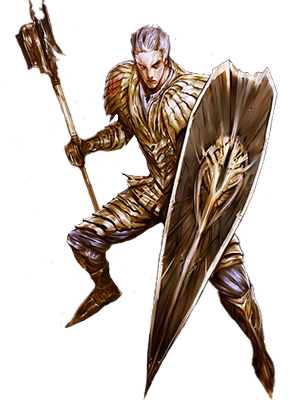 - Paladin : The Paladin is able to attack mentally as well as heal. 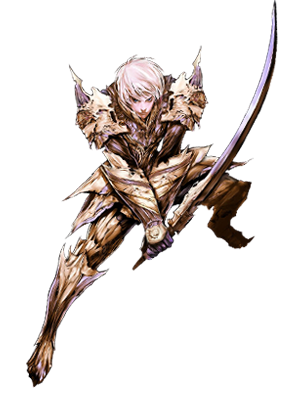 Their skills push and enhance the spirit of the warrior, making the enemy helpless against the curse of a Paladin. - Burka : A relentless attacker that does not give up until death. These infamous warriors are great for melee attacks and are skilled in various weapons. - Burka Master : Masters of swords with skill to decrease or disable an enemy's attack power.